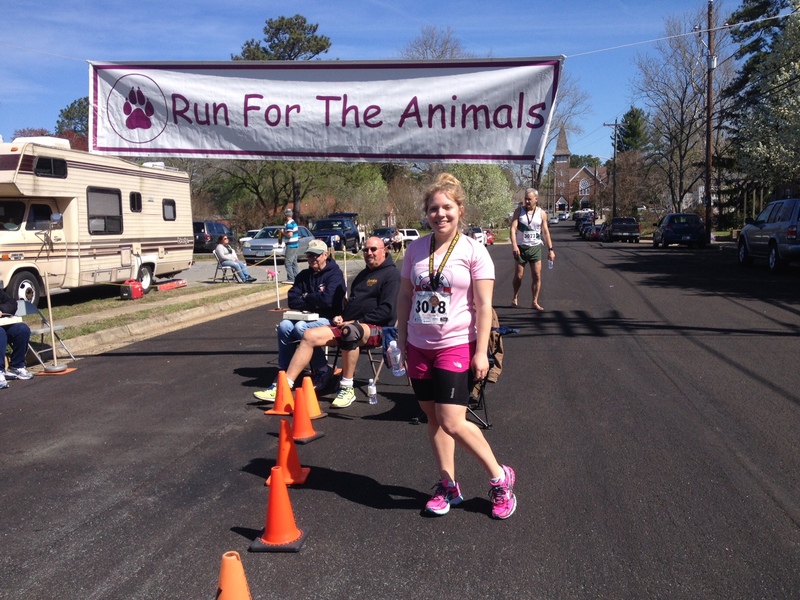 The Run for the Animals this morning in Onancock was my first race on the Eastern Shore of Virginia. It was my first half marathon in which I stopped to use a portable toilet. And it was the first half marathon I finished in more than two hours. 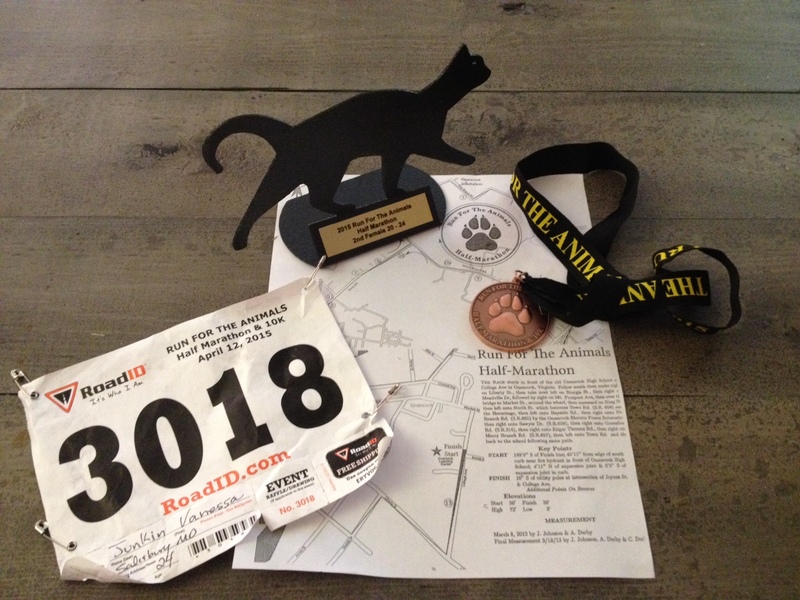 I had a great time at the race, which was this morning — April 12 — and I thought it was well-done: Registration was $40, the course was well-marked and I got to see a bunch of new scenery. Most of the course was very, very rural — police weren’t blocking off any roads, but I didn’t have to wait for any cars to cross. I had featured this race on the blog I had last year, The Road to a Marathon, as I often wrote about local upcoming races (I’m hoping to do more of that soon). It sounded fun, but I already had a race lined up for the same weekend. I also thought the handmade trophies were really cool, and at smaller races, I have a better chance of earning a trophy. I finished in two hours and some amount of seconds (I’ll post my official time once I know what it was), which was the slowest half marathon that I’ve finished. But there was a half marathon that I did not finish, so I really didn’t mind that it was my slowest time. I ended up being the second female finisher in the 20-24 age group, and that could likely be because there were only two people in the age group. (I’m not sure how many there were as of now, but it was a small race.) I think the trophy is really cool, though. UPDATE: My time was 2:00:47 – here are the results – and there were four people in my age group. Also, I’m only talking about half marathon races in relation to times (not training runs). There were some impressive runners. Near the beginning of the race, I heard someone in front of me say her daughter was turning 50 today: Meaning that she would have to be old enough to have a 50-year-old daughter. She finished the race ahead of me. There were also some young children who did the half marathon, including one who I believe was age 9. There was a man who ran the half marathon barefoot. I had to go to the bathroom (No. 1) when the race started. But I wasn’t sure if I would have enough time to go before the race began, so I didn’t. I felt like it was impacting me, and I decided to stop at the portable toilet that was between the mile markers for Mile 6 and 7. I figured I would have more fun if I stopped and went, and there was no line, so I did. Stopping put me behind the group of people I had been running near, and I never caught back up to them. I ended up walking for some stretches. I hadn’t expected the race to feel as hot as it did. On a 3-mile run yesterday, it felt very hot, so I had been planning to wear a tank top for the race. But it was chilly in the early morning. I wore a short-sleeve tech shirt along with shorts and compression shorts, and I felt good at the start. But by the time I got to an area that was less shaded and very sunny, which started after the mile marker for Mile 7 and continued until nearly the mile marker for Mile 10, I believe, I was feeling the heat. I was thinking about my past experiences with dehydration — I have landed in the hospital twice after races, despite being only 24 — and I knew that I didn’t want that to happen again. I wouldn’t want it to happen anyway, but I also was doing this run as part of my training for the Big Sur International Marathon, which is only two weeks away. The loose plan I’d put together had a 14-miler for today, so I figured a half marathon would work. I have been so excited about that race, and it also includes a lot of traveling and money, so of course, I don’t want to do anything that would cause me to miss it. So, I walked some, more than once. At the last water stop, which was at about Mile 10, I asked for three cups of water, which I got, and poured one on my head and drank the other two. I also ate the contents of a pack of Clif Shot Bloks during the race, split between three water stops. 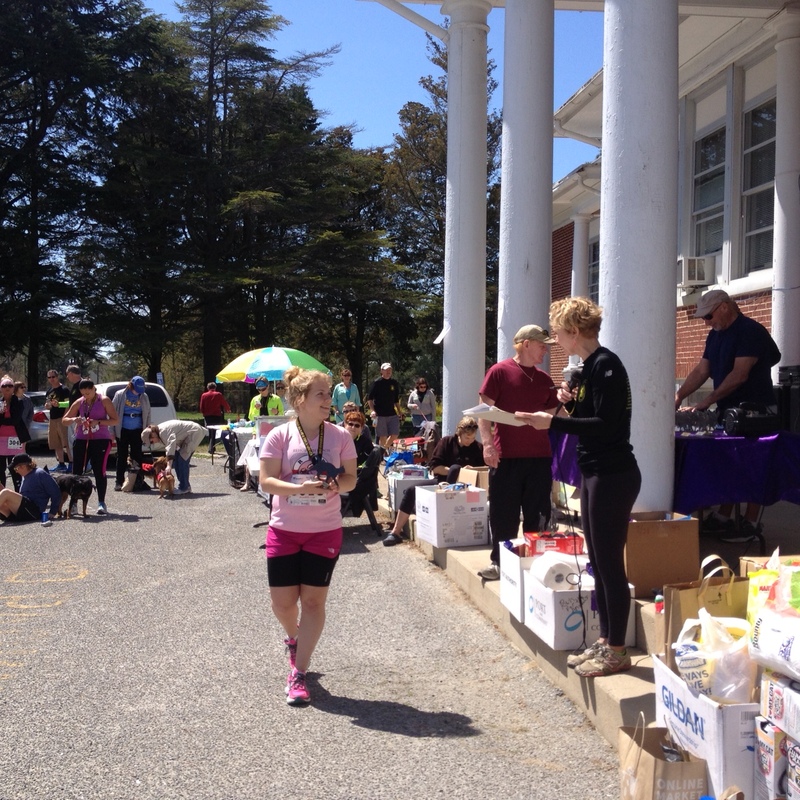 Once I finished, I drank three bottles of water, and also enjoyed the food offerings inside — which were very Eastern Shore. Among the food offered was fried chicken, pasta salad and sweet potato biscuits. 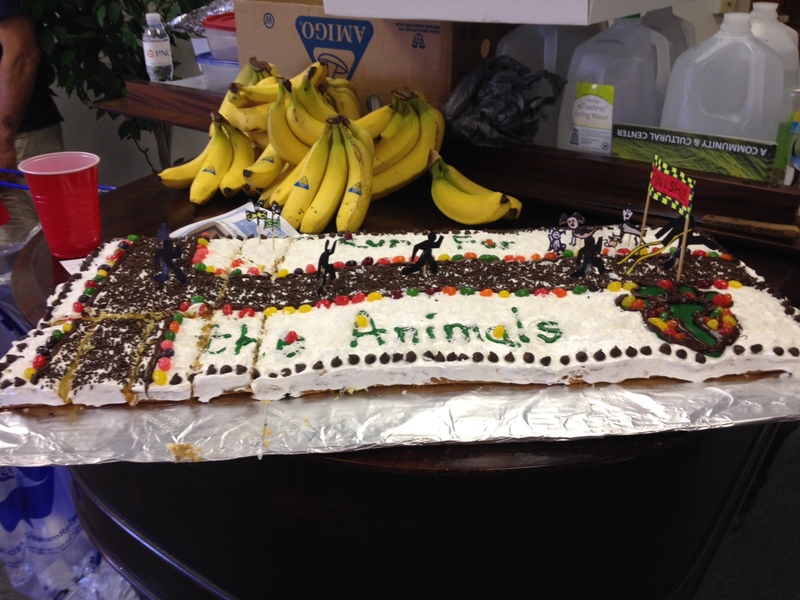 There was also a really cool-looking cake with a finish line on it, with runners and pets. 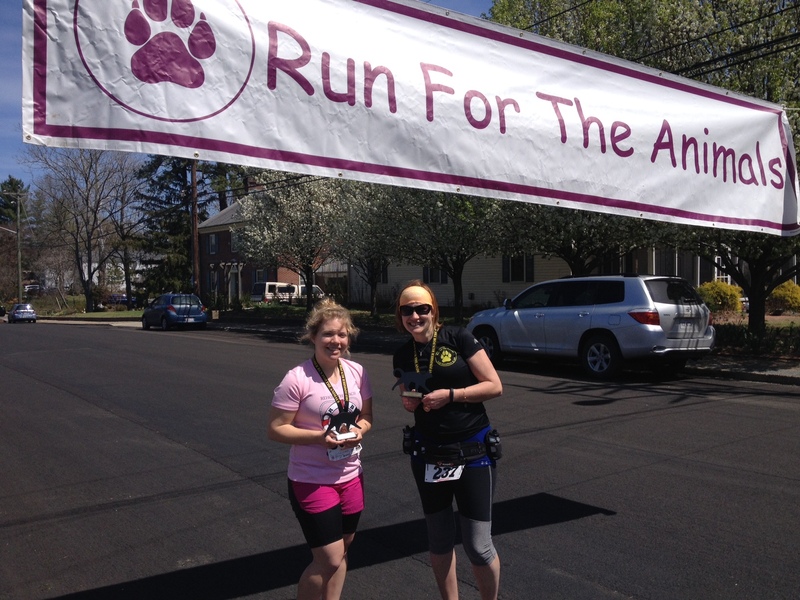 I met Sara Headrick, who ran the 10K, at the Run for the Animals. I’m on the left in the photo. I had fun getting to meet at least one blog reader and another local runner who I had seen and maybe interacted with on Facebook. I had come to the race by myself, but I got to meet several people, which was nice. I will also note as a disclaimer that one of the sponsors on the back of the race shirt was listed as The Eastern Shore News. The Eastern Shore News is owned by the company I work for, Gannett/Delmarva Media Group. I would definitely like to see if I can fit this race into my schedule next year. I will be in a new age group by then, too. I ran the 10k in this race and I’m not a runner but enjoyed myself and didn’t give up. I ended up placing 5th in my age group but there were 11 in the 30-34 group so I figured that wasn’t too bad! Hope to see you again next year. Thank you!! Nice to meet you, too! Great blog – very descriptive. Feel like I was there with you! Sounds fun! Nice job placing!